Have you been hearing a lot about TDS level in drinking water? You must have because that is what all the water purifier companies are talking about. That is one feature that even consumers are going after. But, what exactly is this “TDS”? If you have no clue, let us tell you everything about it, along with how you can measure it. What is the Ideal TDS Level of Drinking Water? How to check the TDS level in water at Home? Does a high TDS level always mean the water is unfit for consumption? How to reduce TDS level in drinking water? TDS stands for “Total Dissolved Solids” and it is the measure of all inorganic and organic substances that are dissolved in water. The very common inorganic substances that are found in water are magnesium, calcium, and potassium. To a certain degree, the presence of these minerals in the water is actually healthy, but when the level becomes too much, it is a cause of worry. By measuring TDS Level in water, you will be able to make sure whether the water you are drinking is pure or impure. Do you know what is the maximum contamination level advised by the EPA Secondary Regulations? The maximum TDS level in water is 500mg/liter. Whether you get your water from the nearby lake or a tank, you must make sure that it meets this mentioned level. If you see that the level is exceeding 1000mg/liter, we suggest that you do not drink that water. World Health Organization (WHO) report on TDS in drinking water points out that reliable data on possible health effects associated with TDS in drinking water is not available. Planning to buy a new water purifier? You may also want to check out our detailed water purifier buying guide or the top list of best water purifiers in India. No health-based guideline value is proposed for ideal TDS of drinking water. Because TDS in water can be high because of many factors so in areas where the TDS content of the water supply is very high, the individual constituents should be identified. The Bureau of Indian Standards (BIS) has set the acceptable limit of TDS in drinking water at 500 mg/L. However, the standard also mentions that in case no alternative source of drinking water is available, then this acceptable limit can be relaxed to 2,000 mg/L. The BIS report also mentions that if the drinking water TDS is higher than 500 mg/L then this may result in a decrease in palatability (acceptable taste) and may cause gastrointestinal irritation. This acceptable TDS limit applies to only normal fresh water, if the water contains toxic impurities like arsenic or fluoride then other special BIS standards will be applicable. It is important to note that some of the dissolved minerals in water are useful for human health and therefore very low or zero TDS is also not recommended. Reducing TDS level to a very low value also affects the Ph of the water, which BIS specifies should be in the range 6.5-8.5. Water with very low TDS will taste dull. There is no official lower limit, but TDS of at least 80 ppm is the accepted minimum level. There are a number of methods by which you can measure the TDS level in the water. We have compiled some of the most common methods that you can use at your home to know whether or not you are drinking safe water. 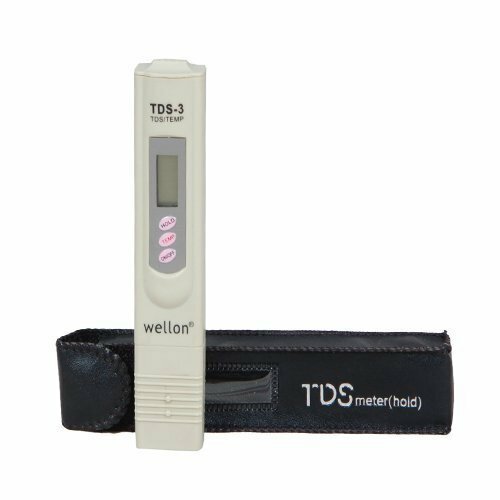 This is a state-of-the-art digital TDS meter tester that you can use to check the performance of your water filter, test the quality of filter water, check for hardness and make sure that you are drinking clean water. 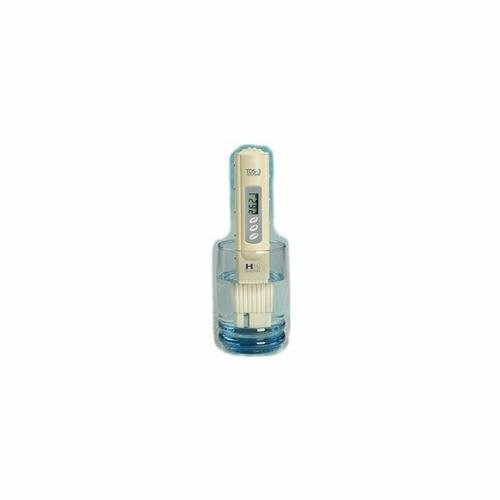 Digital TDS meters are widely available on all the leading online stores in India and you can easily buy a quality Digital TDS Meter in a few hundred rupees. To return to TDS mode, press the TEMP button again. Turn the TDS meter on. You will find the ON/OFF switch is on the panel. Immerse the meter into the water up to the maximum immersion level (2 inch). Gently stir the meter to dislodge any air bubbles. Wait till the reading stabilizes (approximately, 10 seconds). Press the HOLD button and take it out of the water to view the reading. If the meter displays ‘x10’ symbol, it means that you have to multiply the reading by 10. After use, shake off the excess water from your meter and replace the cap. Watch this video on how to measure TDS level in drinking water. Do not dip the meter beyond 2 inch because the meter is not water tight. Do not store the meter in places of high temperature or where direct sunlight comes. This is a conventional method that you can easily use in your home to measure the level of TDS in your drinking water. For this, you do not need any TDS meter, but very simple everyday things. What are the things that you need? A sample of water (tap water or rainwater) in the beaker. A pipette that is large enough to collect a water sample of 50ml. Step 1 – Weigh the evaporating dish in milligrams and make sure that the dish is completely empty, free from any kind of particles. Note this measurement as “A” and come back to it after all the steps have been completed. Step 2 – Take the stirring stick and vigorously stir the sample of water in the sterilized beaker. You need to agitate the liquid so that the particulate matter present in matter gets evenly distributed. Step 3 – Take the pipette and collect 50ml of the stirred water. Please note that even while collecting the water, you have to continue stirring the liquid. Step 4 – Extract water from the pipette and pass it on to the filter paper 3 times. There will be some sediment left behind in the filter paper. Step 5 – If you see any particles in the filter paper, transfer it to the evaporating dish. Step 6 – Wait for the filtrate (particles) to completely dry. Step 7 – Once the filtrate on the evaporating dish is dry, weight the evaporating dish again (with the filtrate) and call it “B”. Step 8 – Measure the TDS level by subtracting B from A. In this formula, A stands for the weight of the evaporating dish + filtrate and B stands for the weight of the evaporating dish. Since 50ml was the quantity that you took in the pipette, the value of “ml” in this case is going to be 50. The final value of the dissolved solid is going to be measured in mg/L. Carefully weigh the evaporating dish and also, the weight of the evaporating dish with the filtrate. Wait for the filtrate or particles to completely dry before proceeding. Always remember that a high TDS does not always necessarily mean that the water is unsafe for consumption. Sometimes it means that it may be a bit odd in terms of taste, color or smell. Ideally, the TDS for drinking water must be below 300mg/liter and maximum 500mg/liter. But it should not less than 100mg/liter for perfect health. Water purifiers that come with reverse osmosis (RO) technology are a great solution to tackle high TDS levels in water. These purifiers are built with cutting-edge technology to ensure that the TDs levels in water are reduced and that the water is safe for drinking. If you are planning to buy one, then you can check the latest range of RO water purifiers. With the help of a TDS meter, you can even check the longevity and functionality of the RO membrane and replace it, if need be. Share this information with your friends and family to equip them with the knowledge needed for checking the TDS level in drinking water. If you know any other way to measure TDS levels, please feel free to comment. Like this information? Or have something to share? Connect with us on Facebook or ask any question in the comments below. Awesome Guide. I used 1st method at my home. Thanks for writing such an guide. Thanks for this beautiful guide. I wanted to check tds of my house water supply and you filter paper method was so convenient for me. Happy to help you. Thanks for your comment. What is the minimum and maximum acceptable tds level for drinking water? I have checked tds in my home water supply with digital tds meter and it shows 260ppm but it taste so nuteral. Please suggest the best tds level that taste good. does it show the reading in µS/cm? Yes, It shows reading in PPM. Is it possible that we can bring TDS from 8k-9k to 2k than we use RO for filtration? If yes than how? Yes it is possible. But the RO purifiers that are available for home use are not suitable for water with such a high level of TDS. You will have to check some industrial water purifiers. By the way what is the source of water that you are trying to purify? Because TDS level of 8,000 is extremely high. We believe you are asking about changing the sediment filter. Sediment filter should be changed at least once a year. But if the water coming to your home is very muddy you should change it earlier. Because if the sediment filter is not replaced on time the dirt and slit will reach the RO membrane which will reduce the life of RO membrane and may affect the purification quality as well. If tds is 530, by boiling the water will the tds come down further? What r the advantages or disadvantages of boiling water? Suspended impurities like: dust, sand etc. Metals like lead, chromium, iron, and copper. Dissolved solids like Sodium, calcium, magnesium. Hello… what is the frequency of testing ro water for tds? Great website, keep it up! Is it OK to post on Linkedin? the TDs of my ro is 156*10 according to my TDS meter , does it need servicing ?